They say you can’t get to Heaven without passing through the Eternal Rest Funeral Home. 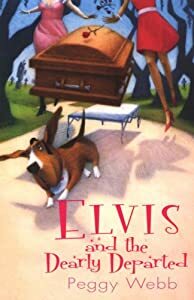 And no one gets into Eternal Rest without passing muster with Elvis-the basset hound who’s convinced he’s the reincarnation of the King of Rock `n’ Roll. Brewing up a big ol’ pitcher of Mississippi mystery, Peggy Webb’s delightful new series is as intoxicating as the Delta breeze. Normally, Callie Valentine Jones spends her days fixing up the hairdos of the dead, but when the corpse of local, prominent physician Dr. Leonard Laton goes missing, it’s bad for business. So Callie and her oversexed cousin Lovie (Eternal Rest’s resident wake caterer) have no choice but to go in hot pursuit of the recently embalmed, last seen bound for Vegas by way of downtown Tupelo. Now Elvis may be nothin’ but a hound dog, but he knows a mystery when he smells one. But keeping his human mom from wandering off the trail isn’t easy when she’s back in the arms of her on-again, off-again ex, Jack. Not to mention the angry mourners squabbling over the estate of the late doctor inside the not-so-restful halls of Eternal Rest. Or the French poodle sniffing around for a hunk of Elvis’ burning love. In Vegas, Callie and Lovie hit the jackpot when they find the dearly departed inside a freezer owned by his showgirl mistress, Bubble Malone. But they’re luck runs out when Bubble decides to join her man in the afterlife. With the poisonous Laton family tree providing plenty of rotten suspects, Callie’s determined to crack this case-with a little help from that irresistible piece of man she used to call her husband-and have a killer singing “Jailhouse Rock” in time for her next haircutting appointment. This entry was posted in Cozy Mystery. Bookmark the permalink. Thanks for stopping by the Den … your blog is wonderful and I enjoy reading your reviews. Keep in touch! Thanks for your comments on my site and reviews.